1) What’s up with Colts running back Trent Richardson? I will start off with a criticism. I think Trent Richardson should really consider dropping some weight. He is listed at 225 pounds, but he looks like he is playing somewhere between 235 and 245. I have heard Gregg Rosenthall of NFL.com’s Around the League Blog opine that Richardson should take a similar approach to Marshawn Lynch who dropped to around 215 when he came to Seattle after looking sluggish in Buffalo. The loss weight clearly made a difference for Lynch and he did not sacrifice any of his power. Richardson would probably regain some of the explosion he showed in college if he dropped some of that extra weight, without sacrificing any of his power or strength. Contrary to what some have said, watching film I still think T-Rich has plenty of burst when hitting the hole, but he could be even better if he played at a lighter weight. Speaking of Lynch, the Colts should watch some tape on how the Seahawks use Lynch and consider deploying Richardson in a similar method. Like Richardson, Lynch is primarily a violent and powerful runner, but unlike Richardson he has not been pigeonholed by his team into that roll. The Seahawks do a tremendous job of getting Lynch into space where he has great movement skills in the open field that compliment his ability to just run people over. The Colts are not doing any of that sort of scheming with Richardson. Too often Richardson is lined up in the I-formation, behind a fullback, and is asked to just slam in between the guard and center (the A-Gap), and most of those runs resulted in lost yards or short gains. I know the Colts want to be a power running team, but they can still accomplish that while finding better ways to use Richardson’s talents. Most of the impressive runs I saw from Richardson came when he was handed the ball in the shotgun or when he ran off-tackle. I think just spreading out the field will help free up more room to get Richardson in space like Seattle does with Lynch. However, as illustrated in this next image, both center Samson Satele and right tackle Gosder Cherilus (one of the Colts strangely overpaid free agent signings) pathetically fail to even get their hands on the Seahawks defensive linemen they are matched up against. The hole that Richardson was looking to burst through evaporates in an instant, and instead he is sandwiched in the backfield by two defenders. This is a drastic example of how bad this line is, but there are far too many plays where Richardson has no holes to run through and is forced to just ram his body into a cluster of defenders. Its way too early to give up on him, but unless the Colts change up how they are deploying him and until his offensive line picks up their play, we may see a lot more of these unspectacular stats from Trent Richardson. Similar to the team they faced in this game, Seattle is playing with a depleted offensive line. The Seahawks are pretty much playing without four starters (their starting left guard is playing out of position at left tackle) and it shows throughout this game. This patchwork unit can run block all right, but as I mentioned, Lynch’s patience and movement in space makes them look much better than they are; he creates more room than they give him. However, they are really bad in pass protection. If they had any quarterback other than Russell Wilson under center they may give up over ten sacks in this game. Wilson’s mobility to elude defenders in the backfield is like nothing I have ever seen before, and unparalleled in the league right now. Even if he was a bit off as a passer in this game, Wilson’s special skill set bailed this offense out more time than he hurt it. 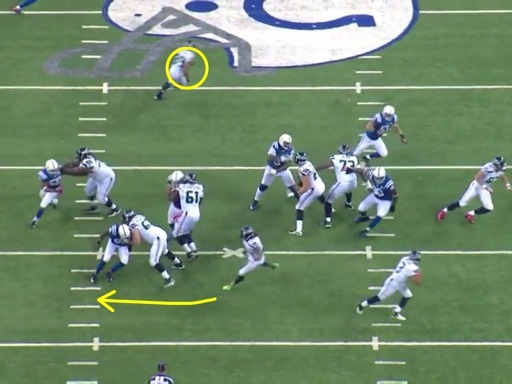 What is really cool about these plays that Seattle runs is that they send the entire offensive line, and Marshawn Lynch, going to the left but then Wilson pulls the ball back and heads to the right. As you can see most of the Colts defense follows the way they think the play is headed, and that allows for slot receiver, Doug Baldwin to be wide open in the middle of the field for an easy 27-yard completion. These are the type of plays that more teams need to implement into their offense, because play design and deception is the key to winning in today's NFL. Watch out for Jermaine Kearse. Some people have been comparing him to Victor Cruz, and just like Cruz did before he broke out, Kearse is making big plays that will get you the trust of your quarterback. Kearse is good at finding the soft spots in the defense and could be ready to explode in the second half of the season. I really think the Seahawks could benefit from a big wide receiver with great ball skills in the A.J. Green mold. Of course, finding those players is much easier said then done. The Seahwks thought they were getting that player when they signed Sidney Rice, but he has not lived up to the money, and I would not be surprised if he is not back with this team next season. With all their other receivers primarily being smaller, slot guys, the Seahawks should be on the look out for a guy who can make plays outside the numbers and actually catch some of the jump balls Wilson throws up. 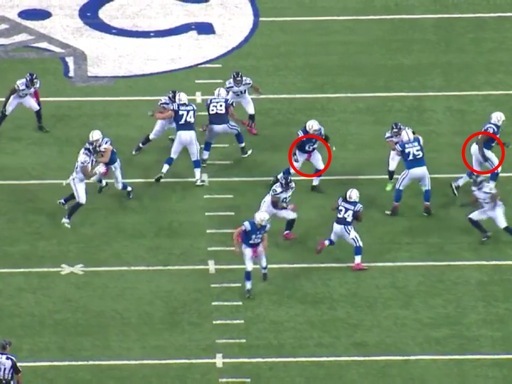 Excuse my obvious assertion, but this is the first chance I have had to watch Luck on All-22 film, and it was joy. His rare talent for a young player was on display in this game. Luck has an uncanny feel for where he needs to be in the pocket. As I mentioned in the Trent Richardson section, this offensive line is really bad, and it is not any better in protection. It does not get a lot of attention, but former first round left tackle Anthony Costanzo is a pretty poor player, and a now healthy Chris Clemons took him to school. Despite facing a ridiculous amount of pressure, Luck almost always stays cool, keeps his eyes down field, and finds a clean spot to throw from. For the deluded people who think arm strength and physical skill sets for quarterback are not of the utmost importance: check out this throw by Andrew Luck on a two-point conversion in the fourth quarter. 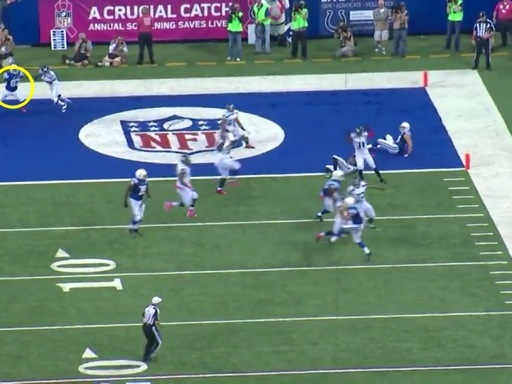 On this play Luck makes what is pretty much an ill-advised decision, as he throws late across his body to Reggie Wayne in the end zone. This usually ends in disaster, but because he is so physically gifted he can still fit the ball into the tightest spaces. There are very few quarterbacks who could make that throw. If you want a comparison, check out Andy Dalton’s interception against the Patriots on Sunday. It is basically the same exact throw, but because Dalton is the poster child for physically limited and mediocre quarterbacks the play is an easy interception. Sherman’s antics make him easy to want to criticize, but he is such a great player that he often does not give people the chance to do that. However, on Sunday when T.Y. Hilton made several deep catches, including two touchdowns, many people took the opportunity to criticize Sherman. However, when I went back and watched Hilton’s two scores, I did not come away think Sherman got burned. On Hilton’s first touchdown he is lined up against Sherman. It looked like Sherman and safety Earl Thomas were pointing back and forth before the ball was snapped. Perhaps there was some sort of miscommunication on defense on this play. Sherman drops back in what looks like zone coverage, and Thomas drops to the deep sideline. Hilton zooms right to the space between them, catches the ball, breaks an attempted tackle form Earl Thomas and races to the end zone. There are too many variables to say that Hilton burned Sherman on that play. T.Y. Hilton’s second score is an easy one to excuse Richard Sherman, because he was not involved in the play. Sherman’s running mate at cornerback, Brandon Browner, is lined up against Hilton in man coverage. Hilton just runs down the sideline and catches a perfect pass from Luck to score an easy touchdown. That is a tough throw to defend, but Browner gets beat by Hilton there. This is just another example of why digging into the film is always better than just listening to the narrative expounded by the media in highlight recaps. In his first game back from a four game suspension, Irvin was lined up extensively in the defensive end/strong side linebacker role that he practiced in a lot during the offseason. This is similar to how another athletic specimen (and top five defensive player in the NFL), Denver’s Von Miller, is deployed to great results. Now, Irvin is not the player that Miller is, and likely will never be, but he will best reach his potential in this sort of role. Irvin is probably too light to have success as an every-down defensive end, but he is still a very good pass rusher and those guys need to be on the field. If Irvin can learn the nuances of playing linebacker, Seattle might just have another stud defender on its hands.